The field of Information Systems has been evolving since the first application of computers in organizations in the early 1950s. Focusing on information systems analysis and design up to and including the 1980s, the field has expanded enormously, with our assumptions about information and knowledge being challenged, along with both intended and unintended consequences of information technology. This prestige reference work offers students and researchers a critical reflection on major topics and current scholarship in the evolving field of Information Systems. This single-volume survey of the field is organized into four parts. The first section deals with Disciplinary and Methodological Foundations. The second section deals with Development, Adoption and Use of MIS – topics that formed the centrepiece of the field of IS in the last century. The third section deals with Managing Organizational IS, Knowledge and Innovation, while the final section considers emerging and continuing issues and controversies in the field – IS in Society and a Global Context. Each chapter provides a balanced overview of current knowledge, identifying issues and discussing relevant debates. 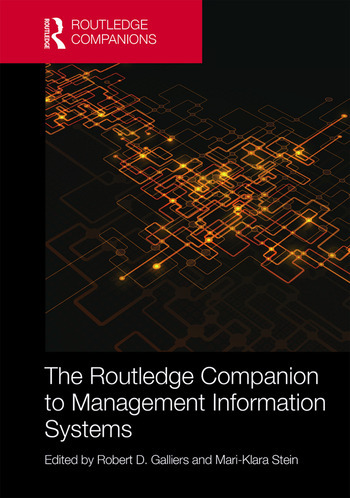 This prestigious book is required reading for any student or researcher in Management Information Systems, academics and students covering the breadth of the field, and established researchers seeking a single-volume repository on the current state of knowledge, current debates and relevant literature. Robert D. Galliers is the University Distinguished Professor at Bentley University. He also holds a fractional appointment as Professor of IS at Loughborough University. His work has been published in many of the leading IS journals and has been cited over 10,000 times. He is editor-in-chief of the Journal of Strategic Information Systems. He received the AIS LEO Award for exceptional lifetime achievement in 2012, and is a Fellow of the AIS, the British Computer Society and the Royal Society of Arts. Mari-Klara Stein is an Associate Professor at the department of Digitalization, Copenhagen Business School. She has published her work in leading IS journals (e.g., MIS Quarterly, Journal of Information Technology, Information & Organization, European Journal of IS). Mari is also the recipient of the 2016 European Research Paper of the Year award from CIONET – a leading community of IT executives in Europe.